Naber Ford Sales Ltd. is a full line & full service Ford Dealer. We are located in the heart of the Parklands, (30 miles west of Prince Albert or 90 miles north of Saskatoon). With some of the worlds finest lakes & parks only minutes away. On August 1, 1986 Agnew Motors was purchased by Jim Naber & his sons Tim & Tom Naber to become Naber Ford Sales Ltd. The original location was on Main Street of Shellbrook in a building, which was built in 1915 as the 1st Ford dealer in the area. On December 15,1991 a fire, started by an electrical short, completely destroyed the 76 year old building. This was quite a shock to the community & Naber family, but the decision to rebuild a larger modern builing on the location of Hwy #3 & #55 North was made quickly & construction was complete in December of 1992. Jim is a home grown Saskatchewan man. His background is in farming, so his natural interests lie in rural Saskatchewan. His love for people & Ford vehicles make him a great Dealer Principal. The Naber boys have 30 years of sales & service experience. They have been living & breathing their dream of Ford vehicles since the dealership was purchased in 1986. They are avid sportsmen, with a strong commitment to their families & the community they have chosen to operate their Ford dealership in. 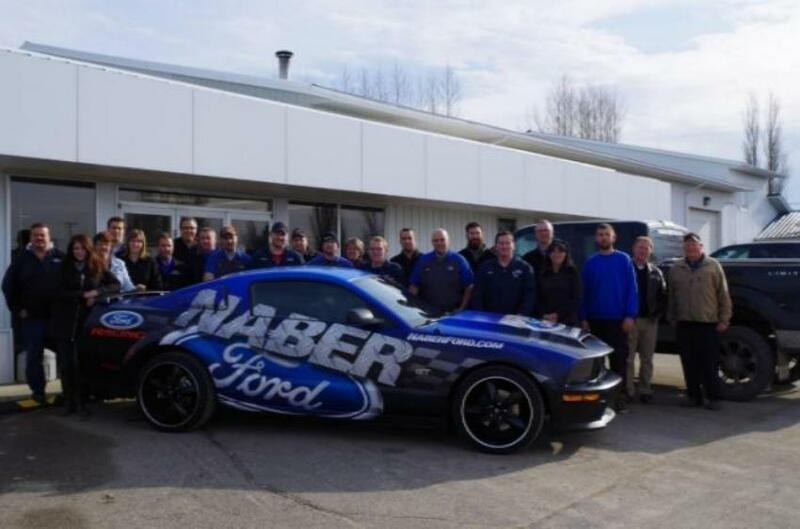 Naber Ford prides itself on honesty & integrity & treating our customers as we would like to be treated. Our motto is, "we are with you every mile". Stop by Naber Ford Sales for all your Ford service needs. Questions? Any of our knowledgeable service and sales people can help. Call 888-481-0197.